Medium - $39.99 Only 5 left! Yeah, okay, so we don't know that much about football. What we mean to say is we get the sport (kind of) but we've got no clue when it comes to players, stats, teams, or anything like that. We don't know who's the best (or the worst) or why the logo of a set of diamonds should mean anything. So, when we say this solid red outfit, we got excited. Why you ask? Well because we don't need to know any names or players or stats! We can just root for our favorite color! Go red people! Yeah! We're big fans of red. Color of passion, heat, blood... all very exciting! And we think your little one would like this exciting colored football outfit too. After all, they could put their own names, logos or patches on it, romp around like their football player, or just bash around the back yard, which all sound like totally fun options to us. 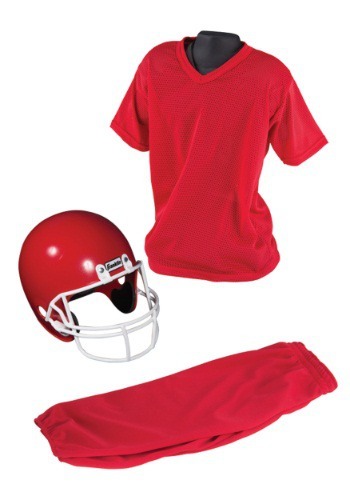 So, if you're like us and you're all for the red team, consider this Child Deluxe Football Red Uniform Set for your kid. It's got a red mesh v-neck jersey, crop pants with elastic in the hems, and a red plastic helmet (not meant to be used in any actual sport). Then your kid could be part of the Red runners! The scarlet smashers! Or, you know, just run around in a red football outfit because they want to.